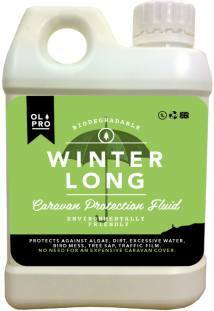 A concentrated formula caravan protection fluid, which provides protection whilst your caravan or motorhome is in storage or not in use over winter. The special formula creates a protective layer over your caravan during storage. It protects against Algae, Dirt, Excessive water, Bird Mess, Tree Sap, Traffic Film. Half a bottle of Winter Long Caravan Protection should cover any caravan or motorhome, so two years worth of cover in a single bottle if used once per season! Simply Wash your caravan or motorhome with OLPros Inside & Out and then apply Winter Long, and then wash off when you're ready to use the caravan or motorhome. We have teamed up with OLPro and are offering you the chance to win one of 10 bottles of Winter Long, worth £7.99 each. To find out more and for your chance to enter, click here - competition now closed!